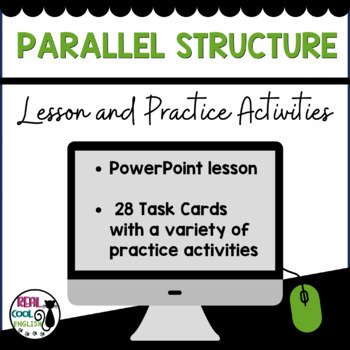 Complete, no-prep lesson on parallel structure with 28 task cards to practice identifying and correcting sentences that are not parallel. 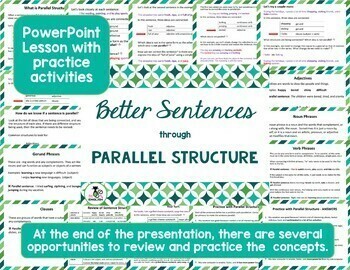 * PowerPoint presentation with explanation of parallel structure and many example sentences for students to clearly understand how to analyze a sentence and make necessary changes to make the sentence parallel. At the end of the presentation, there are more opportunities for students to practice individually or in pairs. 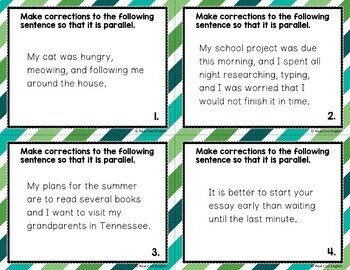 * Set of 28 task cards for students to practice analyzing sentences to correct problems with parallelism. 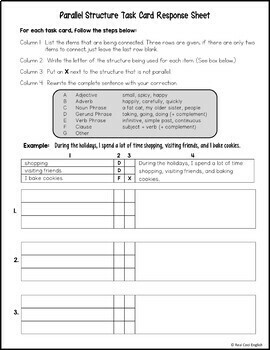 * Response sheet with spaces for students to identify the connected parts, analyze the structures, and rewrite the sentence correctly. * Answer key for all task cards with notes for certain answers that might need further explanation. Consider purchasing the PowerPoint Lesson and Practice Activities Growing Bundle and get access to all current and future PowerPoint lesson and activity resources. Bundle price will increase as new resources are added, so grab it at the lowest price now!